It is incredible what you find, when you start to look. There is a certain sloe which grows along the River Witham in Grantham, and for some reason it seems to beat every other blackthorn to bloom. I was walking along in March and saw a bumblebee visiting the flowers. 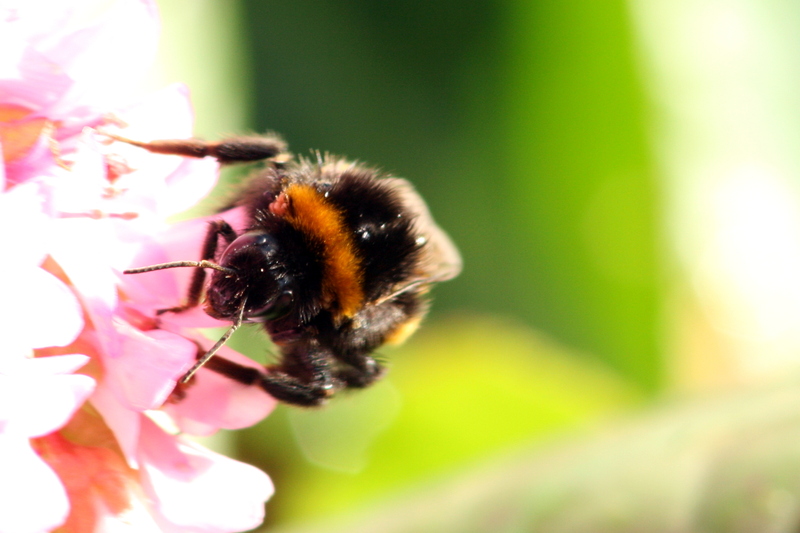 It turned out to be a tree bumblebee – the first species I could name beyond ‘bumble’. Throughout the summer, I have added new bumblebees to my acquaintance as well as many other characters which together make up the family bee. I have very much more to learn and look forward to doing for many years to come, but I was amazed at just how much I have never noticed before. I have gone all these years and yet never seen mining bees visiting the garden, or the nomad bees lurking near their nests. I have never watched mason bees collecting mud or realised that they have their tunnels in the walls of our house. Tiny, beautiful solitary bees and huge queen bumblebees, leafcutters and honey bees and that’s before we even get on to all the pretenders; the hoverflies and beeflies which imitate and exploit! I have illustrated below just a few of those I have been lucky enough to see this year, I hope it might inspire you to explore for yourself. Early in the year, the queens emerge from hibernation and feast on the early flowering plants; the heathers and hellebores were a favourite in the garden whilst long-season gorse flowers are an ideal early-spring feed in the wild. These queens will establish nests and then the whole process of ID becomes more complicated as the workers and males appear – similar but subtly different to the queens of the species. 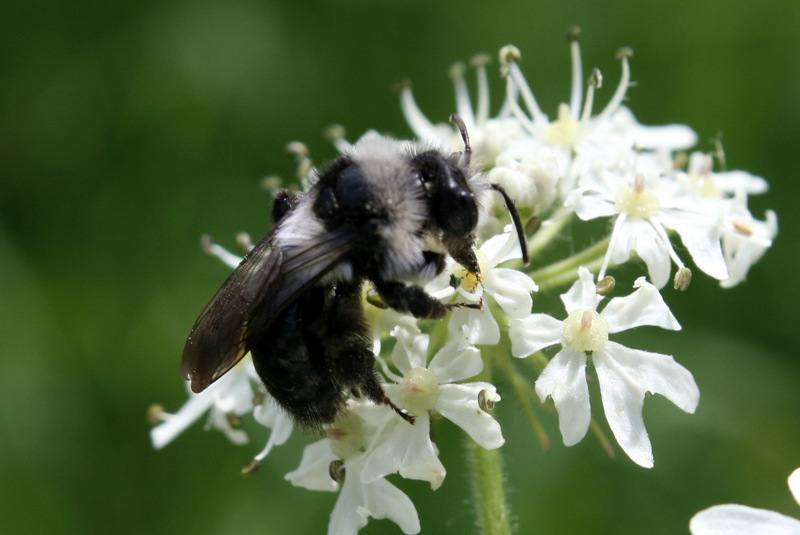 There are 24 species in the UK but around six are the most commonly encountered; the Bumblebee Conservation website is a fantastic resource to get you started and with a few key ID tips, you are well on your way with most species! These bees are so named because they dig holes in the ground in which to lay their eggs. 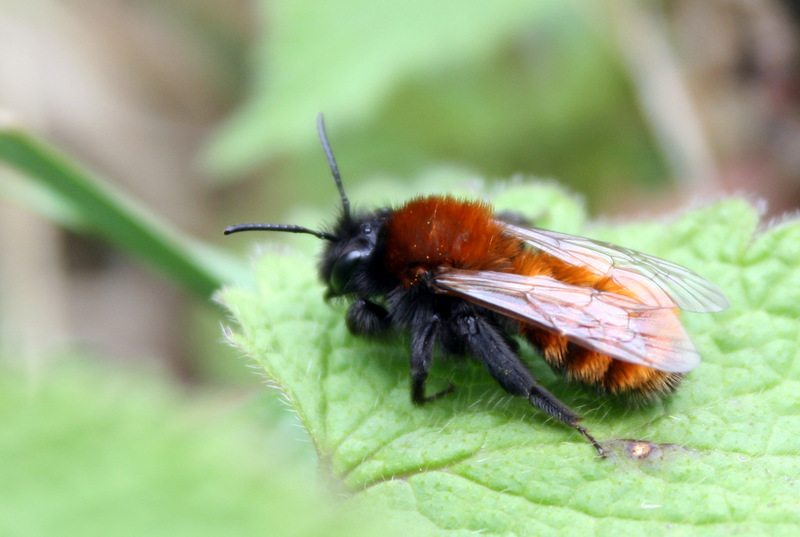 There are around 100 species in the UK and they include some exquisitely beautiful specimens such as the tawny mining bee which is a stunning shade of autumnal red. The ashy mining bee and early mining bee also paid a visit to my garden this year. In contrast to the bumblebees, they are largely solitary although some species do nest communally. 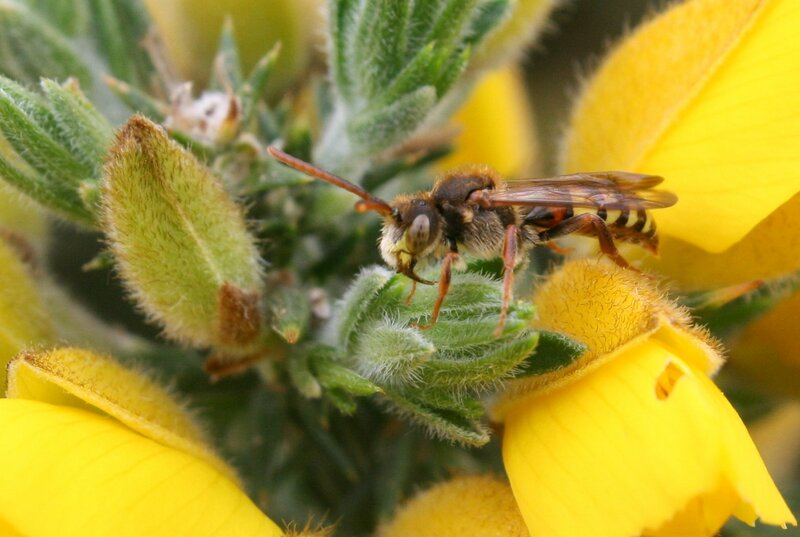 These small bees are not immediately obvious to identify as such on first glance – they are rather more wasp-like than bee-like. 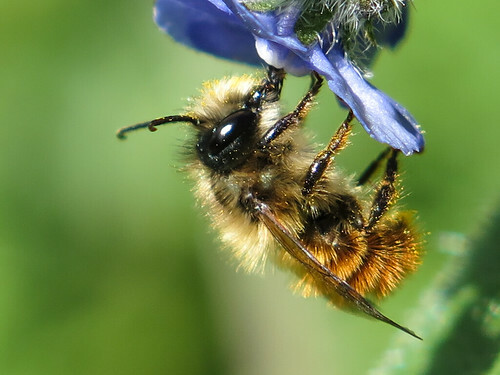 There are around 30 different species and they parasitise the nests of other bees – especially mining bees – laying their eggs in the nests which gives rise to the alternative name of ‘cuckoo bee’. There are also cuckoo bumblebees which behave in a similar manner with the nests of bumblebees although I have not (yet) managed to spot one of these. 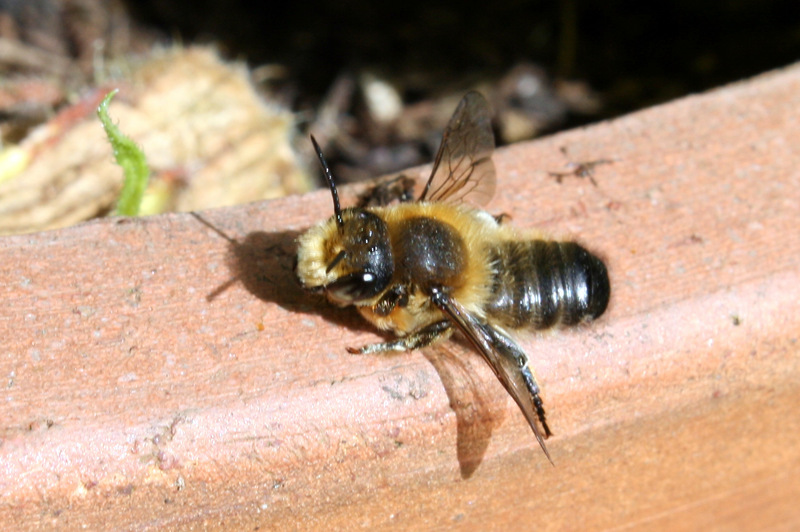 There are several species of mason bees in the UK – these are so called because they use mud when constructing their nest. We have red mason bees nesting in holes in the pointing of our house but many different crevices and cavities can be used. The bees lay their eggs inside the tube structures and then seal the end with mud. I came across a ‘mud mine’ down beside the River Witham in Grantham where mason bees were coming and going collecting mud, with up to 10 present at any time. 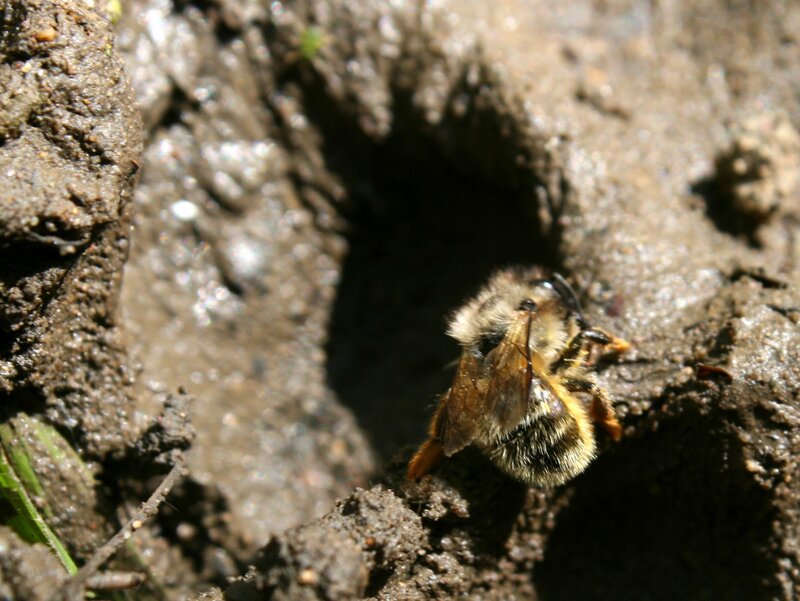 The hollows you can see in the photograph were excavated by these bees which gather up the mud and fly back to their nesting sites with it clutched between their mandibles. 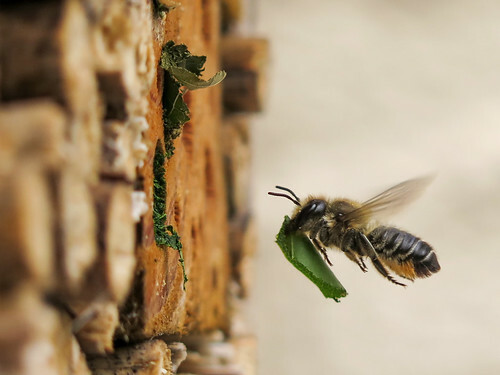 These bees have a similar ecology to the mason bees, only they use leaves instead of mud as their medium of choice when sealing up their entrances. I spotted this one in our back garden but was lucky enough to watch one ferrying segments of rose leaf from a nearby bush to a bee-hotel in my parents garden. The semi-circular cuts around the edge of the leaf are quite distinctive when you’ve seen them once and a sure sign that these bees are around. There are a large number of small solitary bees which are often difficult to identify as they are so small and subtly different. This one was identified for me as a male Lasioglossum calceatum, probably the commonest of this particular genus in the UK. 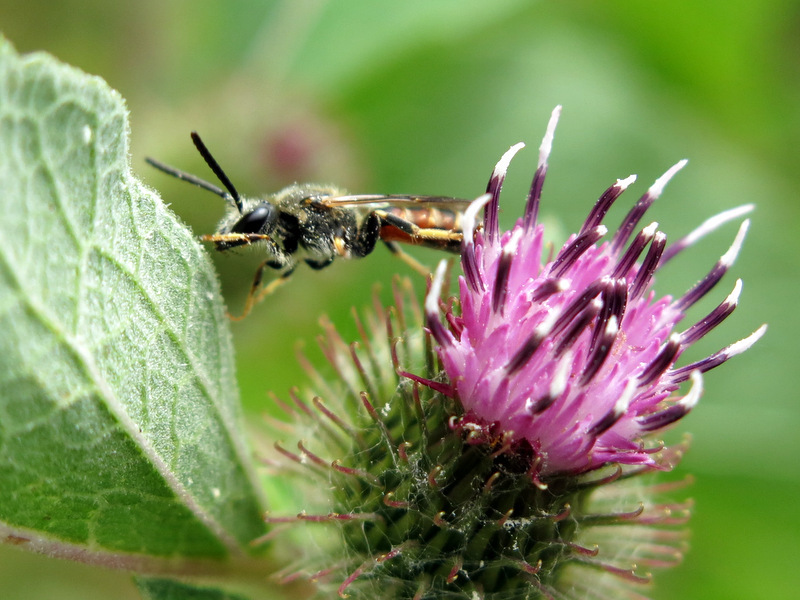 A male Lasioglossum calceatum solitary bee on a burdock flower – distance is relative! 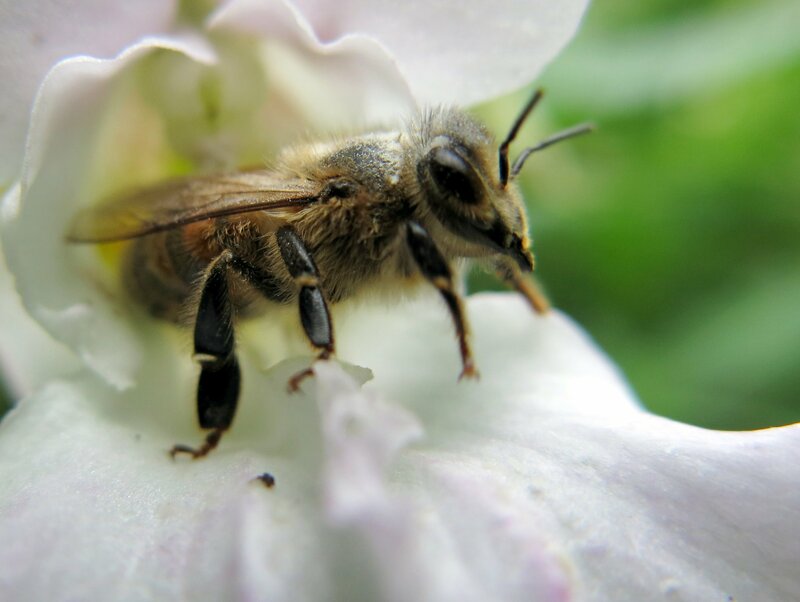 There is only one honey bee species in the UK and it is quite distinct from the rest. Whilst the patterns may vary, the shape and general demeanor make them quite distinctive. Many honey bees belong to hives but wild populations also exist and you can see them from the first spring sunshine through to the last throes of summer. 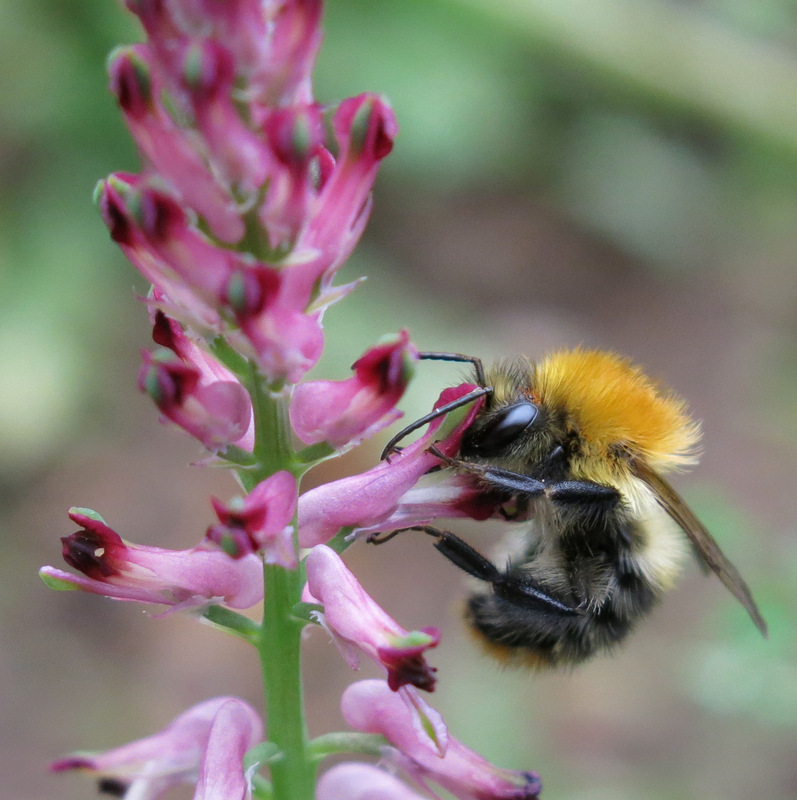 The active season for many invertebrates, including the bees, is coming to an end. Common carder bumblebees are still around in good numbers but it won’t be long until they too vanish from the flowers. I am already looking forward to next spring when the queens emerge from their hibernation and there will be a new host of commonplace marvels to notice for the first time. The sheer diversity is breathtaking – it only requires you to bend a little closer to the ground to take it in. I would cordially invite you to do so! Making a home for the birds and the… bees! National Nestbox Week is designed to encourage people to provide more homes for wildlife in their gardens – why stop with the birds? 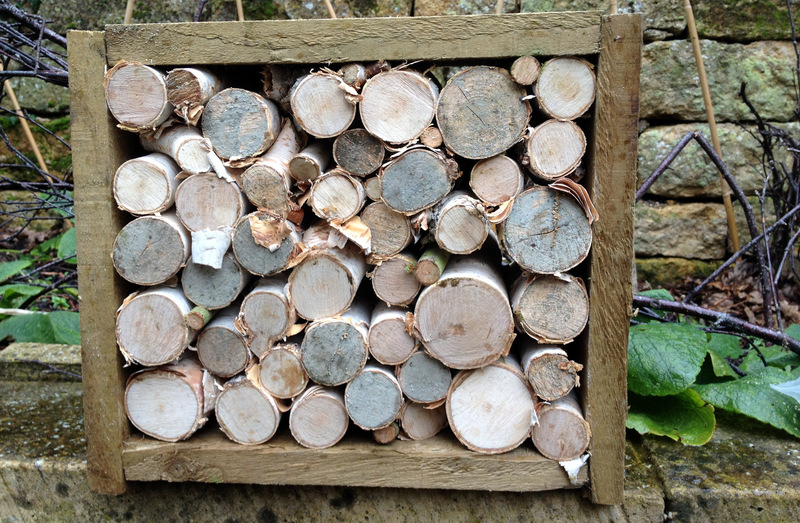 I spent last Sunday making bird boxes, bat boxes and this – a home for solitary bees. I confess to knowing very little about these bees but I do find them fascinating – I watched one coming and going from an old drill-hole in a fence post in the garden last summer and meant then to do something to increase the availability of suitable niches for them this year. 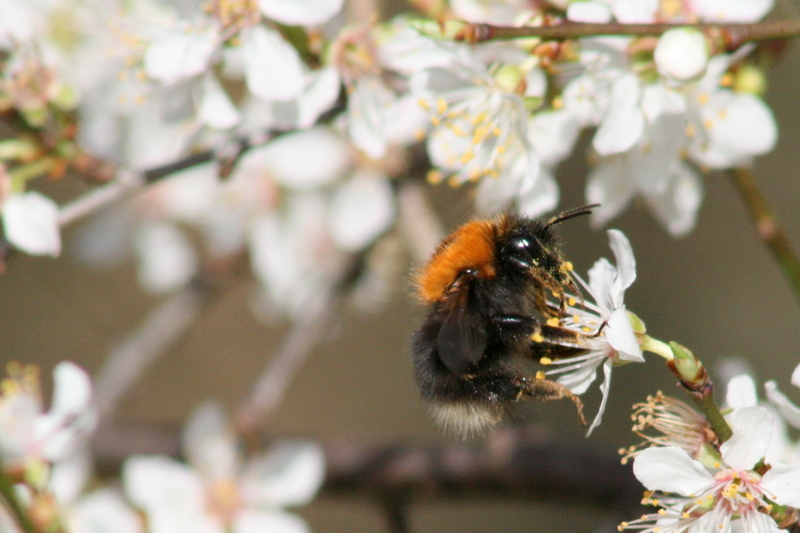 February is the ideal time to install these habitat features – it gives them time to naturalise a bit as well as ensure that they are in evidence for any bees which may be seeking a home as the temperatures rise in the spring. You may well have seen various bee houses for sale in garden centres and similar gift shops. I have always been surprised at quite how much these cost, although drilling all of the holes made me re-consider the economy of having somebody else do it for me! Nontheless, I rescued a selection of silver birch logs from my parents’ house (they recently took down a tree and the logs seemed too beautiful to be consigned to the ashes of the logburner) and set about making a mini bee hotel. The logs were cut into 7 inch sections and I made a simple frame from some old offcuts of wood to hold them. I would suggest, if you choose this approach, to screw the frame together very firmly. This allows you to pack the logs in tight and hammer in additional smaller pieces to fill in the gaps and keep them in place, using the tension of the solid frame to hold against. Once I had arranged the logs in a fairly stable manner within the frame, I set to work drilling holes in the logs, being careful to remove as much of the sawdust as possible and making sure that they were pointing slightly upwards to stop the rain from getting in. 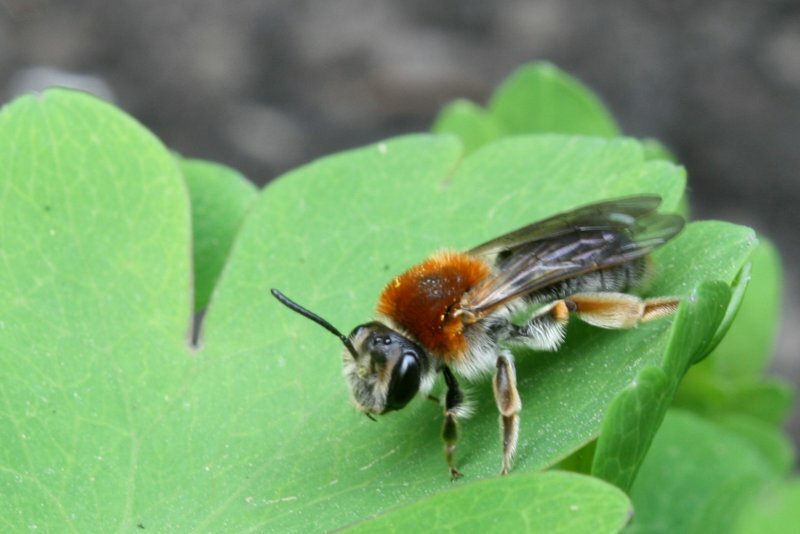 This guide provides an excellent introduction to making these habitats and, following its recommendations, I have made holes from 2mm to 8mm in order to attract a range of different types of solitary bee. I could not find much in the way of siting recommendations for these habitats although one page on the Telegraph website suggested the sunniest spot in the garden. Our garden is quite shaded but I have selected a spot near the vegetable and herb garden, to encourage pollinators to our vegetables this year, where the sun shines throughout the morning and should provide warm conditions. It also benefits from being sheltered to prevent rain from reaching the bee hotel. Below are some step-by-step photographs showing the creation of the feature – I will hopefully update in the summer to describe all of the bees which have come to use it! If you wanted to encourage bees in a more casual way, the guide recommends simply drilling holes into fence posts and other logs and pieces of wood around the garden. This creates less of a feature but, in terms of encouraging biodiversity into your garden, it is ideal! 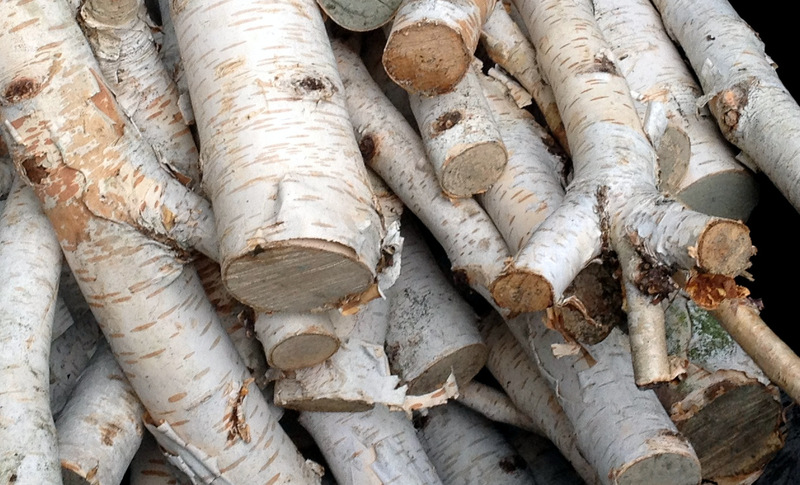 Silver birch logs which looked too beautiful to burn! 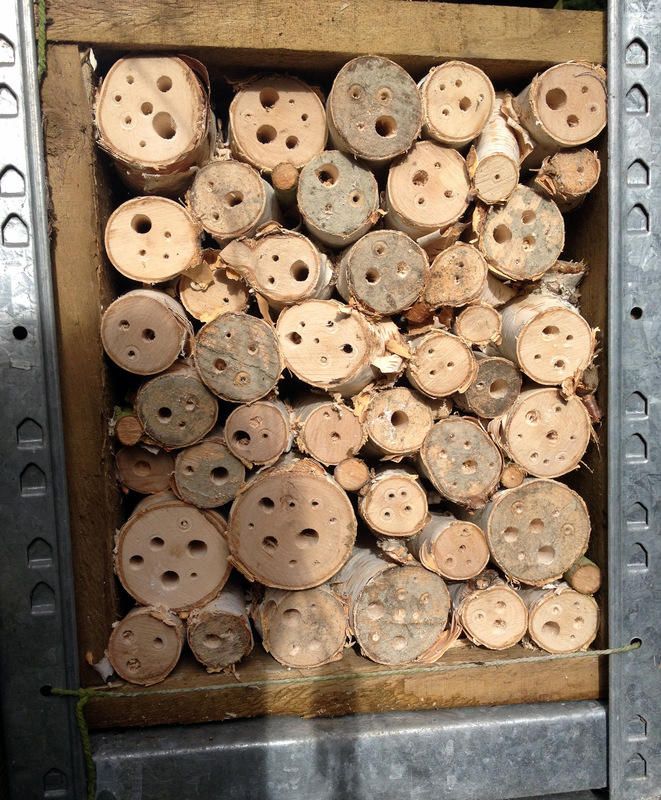 Cut the logs into 7in sections which can then be drilled longways to create the holes for use by solitary bees. The logs stacked inside a simple wooden frame made from offcuts of wood. It took a while to arrange them all in a stable manner but a sturdy frame allows you to hammer in additional smaller pieces to pack the logs in, using the tension of the frame to hold them in place. Then drill! This is the finished product, filled with various sized holes from 2mm up to 8mm. I would suggest drilling all holes with a small drill bit to begin with, then widen some of them to different sizes as starting work with an 8mm bit is tough going! The metal around the outside is not part of the design, rather the shelving unit behind a shed where pots are kept – it faces onto the vegetable and herb beds whilst the shef above it also provides cover from the rain.